If you’ve ever so much as googled “trekking in Nepal,” you’ve undoubtedly discovered the majestic beauty of the Annapurna Circuit and the heart-pounding challenge of the Everest Base Camp treks. While the vast majority of trekkers in Nepal end up hiking one of these two trails, many other lesser-known hikes await those eager to get off the beaten path. One of the newest additions to the Nepali trekking options is the Ruby Valley Trail, which offers the perfect combination of incredible scenery and cultural immersion that you might be hoping to gain from your trip to Nepal. Lest you think this is a newly constructed trail specifically for hikers, let me assure you that the Ruby Valley Trail is not new in the physical sense of the word. The trail is actually just the route through the mountains that the locals walk between villages each day. The Ruby Valley Trail, which offers views of Ganesh Himal, is predominantly at low elevations, starting at around 5,000 feet and increasing to approximately 14,000 feet at Pangsang Pass. The trail is accessible by a 7-8 hour jeep ride from Kathmandu to Darkha Phedi and takes approximately 6 days to reach Gatlang, depending on fitness level. From there, trekkers can continue on to the Tamang Heritage Trail in the Langtang Region or take a jeep back to Kathmandu or another trek. While snowcapped mountains may be what you envision when you think of Nepal, the Ruby Valley is at lower elevations. 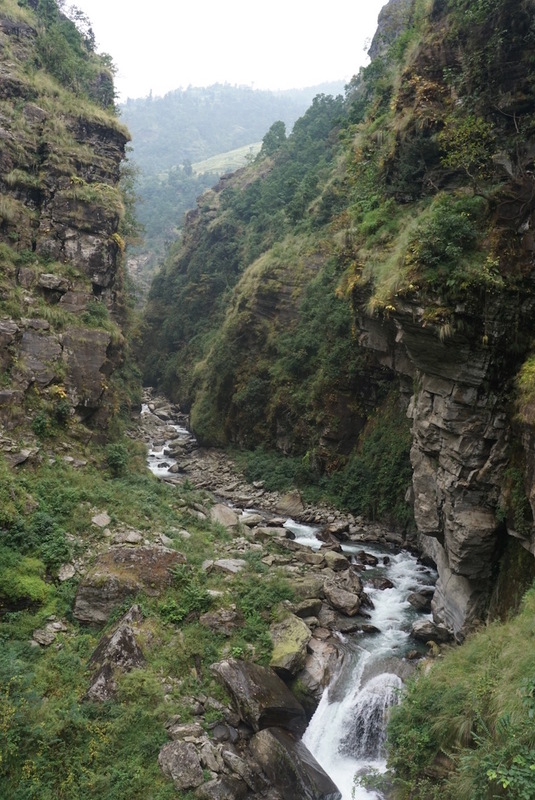 You’ll be privy to near constant views of the winding Ankhu Khola River, which snakes its way through the valley, and the surrounding mountains (although the locals call them hills). The scenery is lush and green in the fall after the rainy season, and rice paddies abound until you reach about 8,000 feet in elevation. You’ll also get a periodic glimpse of Ganesh Himal (one of the famed snowcapped mountains). The scenery is truly breathtaking, with waterfalls all along the route and sweeping panoramic views of the valley. If you’re looking for a mix of culture and scenery, this is the trail for you. 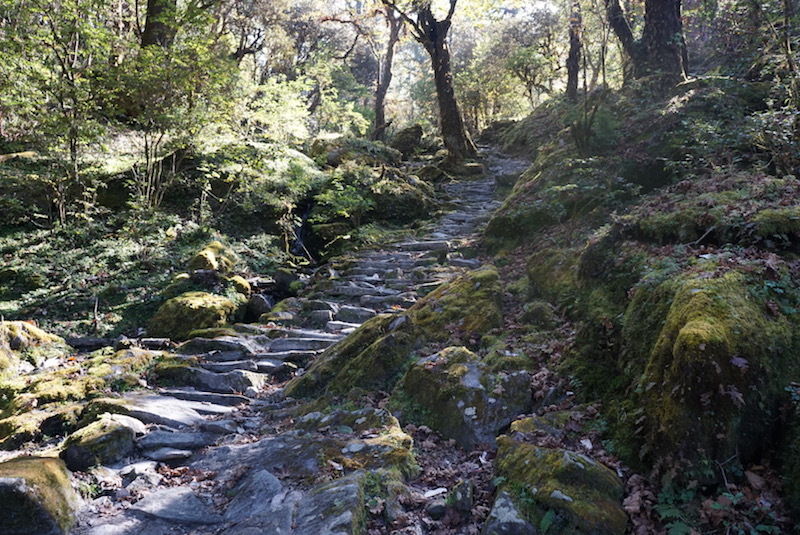 Unlike the more developed trails and areas of Nepal, the Ruby Valley Trail has no tourist infrastructure. Trekkers are able to stay in local lodges (not to be confused with the tourist lodges on more popular trails) in some villages, but the majority of accommodations will homestays. In my opinion, this is one of the best things about the Ruby Valley Trail! 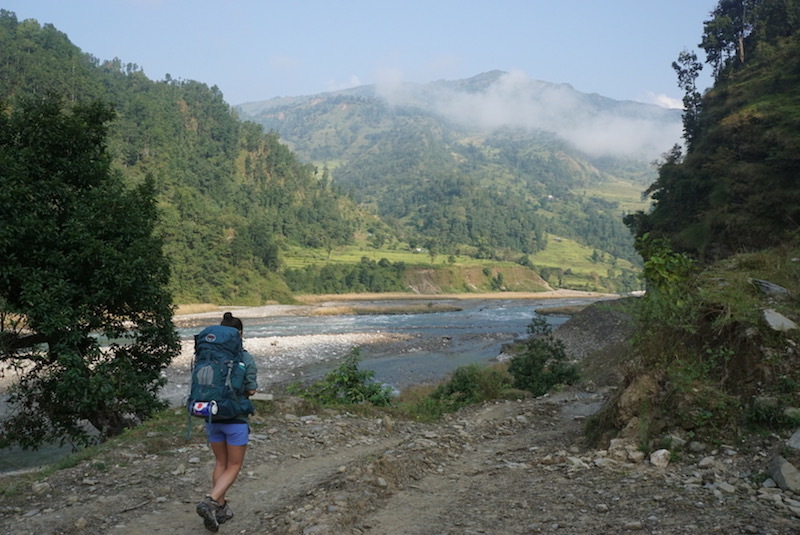 The lack of tourist infrastructure means you’re unlikely to encounter any tourists at all along your trek (we didn’t) and you’re guaranteed a chance to engage with the locals authentically and live like a Nepali, even for just a few days. These accommodations are extremely basic, as you are staying in local homes, and may include sleeping on the floor, in outbuildings, or in a guest room reserved especially for the occasion – it all depends on where you stay! However, one thing that all guests can guarantee is privacy. Guests will stay in a room separate from the local family. Bathrooms will be traditional Nepali squat toilets and out buildings, so BYOTP – bring your own toilet paper! While many of the tourist lodges and hotels on other trails offer a wide menu of Western cuisine and Nepali dishes, food on the Ruby Valley Trail is decidedly simple and usually consists of two options: dal bhat (the Nepali staple of rice, lentil soup, and curried vegetables) or noodles that are similar to ramen. 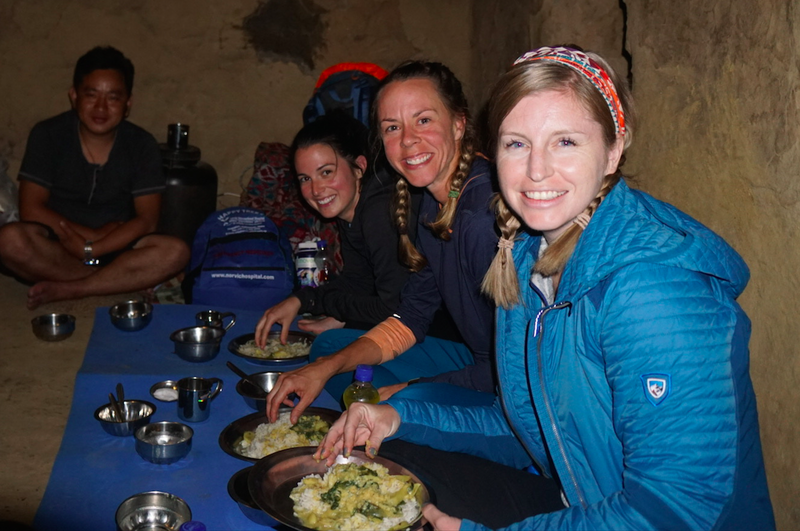 Dal bhat is usually eaten three times a day in villages along the trail, so you’ll always have that option, and I highly recommend taking it! It’s a delicious experiment to explore how the flavors and ingredients change from the lower elevations to the higher elevations. Pro tip: It’s not recommended for western visitors to eat meat in Nepal, especially in very rural areas, because of issues with food storage and refrigeration (i.e. there is no refrigeration). If you’re craving protein, ask for eggs – they’re always fresh! While the Ruby Valley Trail is certainly safe for a self-guided trek, it is also a bit confusing and it is recommended to use a guide. Additionally, the locals speak no English whatsoever (as they have no opportunity to converse with Westerners), so unless you speak Nepali, you’ll have a hard time communicating. There are also no signs pointing to homestays or lodges, since they are only known to local people and aren’t geared towards tourists. Long story short: get a guide. Bonus points if you manage to find one from the Ruby Valley itself! We never would have found our homestay in Chalish without our guide! We stayed with his parents! Hiking the Ruby Valley is not for the weak, although how strenuous you find the trail to be will largely depend on the speed at which you hike it. The Ruby Valley basically traverses the side of a mountain range (although the Nepali refer to these particular mountains as “hills,” which is rather defeating as you’re huffing and puffing your way up them), meaning you’re constantly crossing from mountain to mountain and going up and down nonstop. In four days of hiking, I experienced more than 25,000 feet of elevation gain – nearly 6,000 feet per day! The weight of your pack will play a big role in the difficulty, so pack light or pay for a porter. You can expect to trek anywhere from 5 – 10 miles a day depending on your itinerary and your fitness level, so make sure to do an honest and thorough assessment of your fitness when planning your trip. Be ready for lots of stone stairs and a mountain pass or two! As you might expect, connectivity is limited in such a rural area. The Ruby Valley itself has no mobile phone reception whatsoever and no WiFi, so don’t expect to be able to contact loved ones at home. Some villages do have a (single) landline, but they only work for local numbers. Mobile reception is not available until a day and half’s walk past Pangsang Pass, so come prepared to unwind.Electricity, however, is more prevalent than you might expect. Several villages have wired electricity for several hours per day (although few have any place to charge your devices), while the others have solar lights. Headlamps are certainly useful, but you may have more light at night than you expect. Who needs internet when you've got this view? 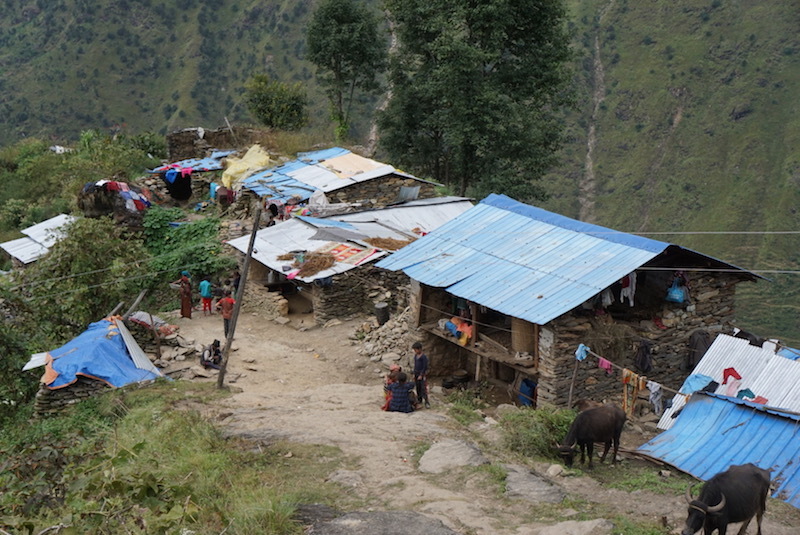 As stated previously, most of the villagers you will meet and interact with speak Nepali and no English. 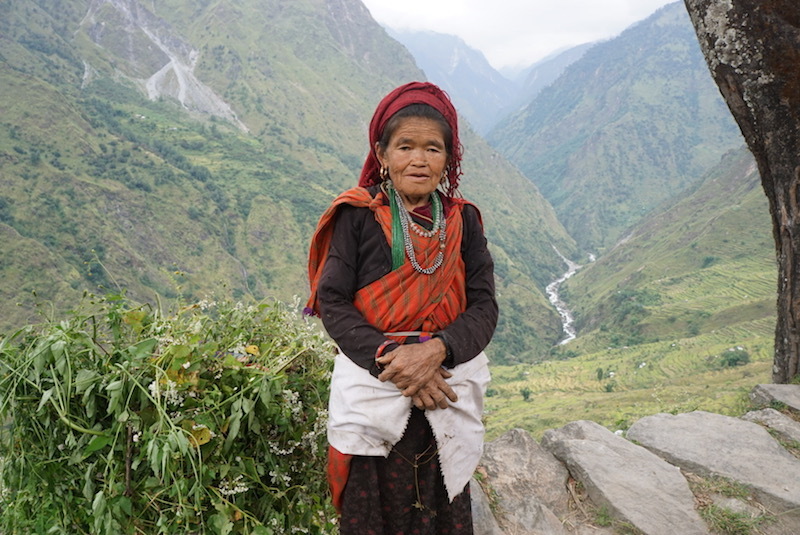 Some of the elders may speak only their ethnic language, such as Tamang – this is where a guide comes in handy! Learning a few words of the local language is highly admired and appreciated, and the locals will often laugh in surprise at hearing the Nepali phrase for “Thank you” (“Dhanyabad”). A little goes a long way, so even if you are traveling with a guide, consider trying to pick up some key phrases. It makes connecting with the locals much easier. The sanitation levels in some parts of Nepal, including the Ruby Valley, may be a bit of an adjustment for Western travelers, particularly those with little experience traveling in developed countries. Unsurprisingly, there are few disinfectant soaps and cleaning supplies to go around, so while toilets are actually surprisingly clean, it won’t be like it is at home. Western tourists will not be able to drink the water anywhere in Nepal without carefully filtering it first, but you also must remember not to brush your teeth (or rinse your toothbrush), wash your hands with open cuts, etc without filtering the water. There are many ways to get sick while traveling in Nepal, but water is the most common. There are many types of filters that do the trick, but make sure you purchase one that kills not only bacteria and protozoa, but also viruses. Bring hand sanitizer and use it regularly. Most importantly, make peace with the fact that you are not at home, and let go of your germaphobia as much as you can or you’ll drive yourself crazy. Sharing the road, Nepali style! If you’re interested in hiking the Ruby Valley – as you should be. However the trail isn’t well known, so many local companies do not offer treks to the area, so you’ll need a more local organization. 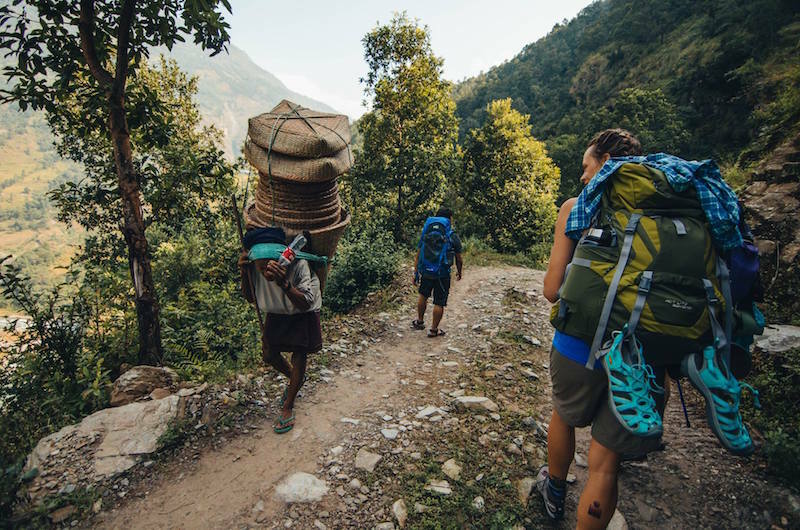 UpEverest works with local guides who were raised in the surrounding villages and know the trail like the back of their hands, so you know you’re in good hands. Get ready – you’re in for the trip of a lifetime! The T-Rex Runner. She is a 50-time marathoner, world traveler, and Mexican food enthusiast whose main goal is to encourage other people, especially women, to pursue their dreams in the face of obstacles. 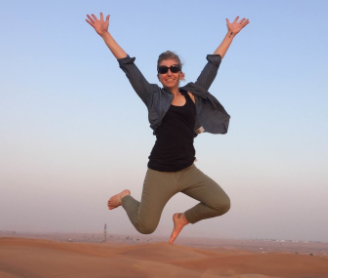 Danielle loves finding off-the-beaten-path adventures that are still accessible to the average traveler and seeks to engage with the local community as much as possible. The more adventurous and active her trips are, the better! 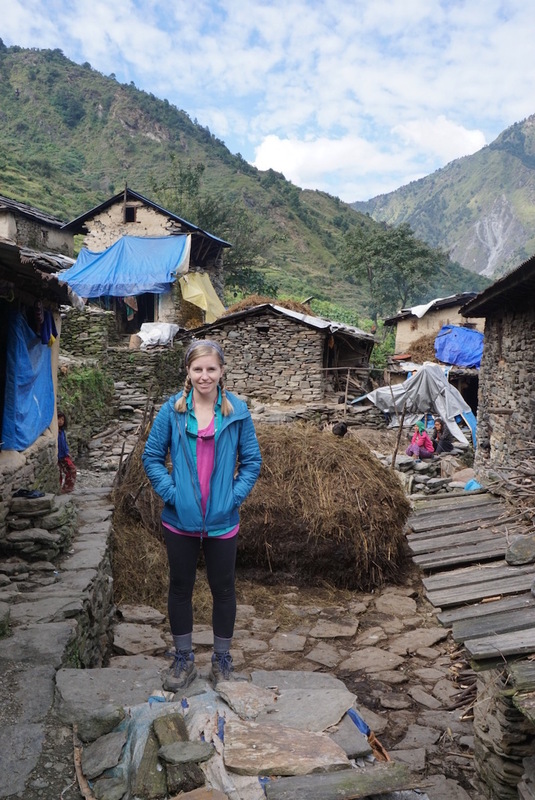 Danielle fulfilled a lifelong dream by visiting Nepal in October 2016. 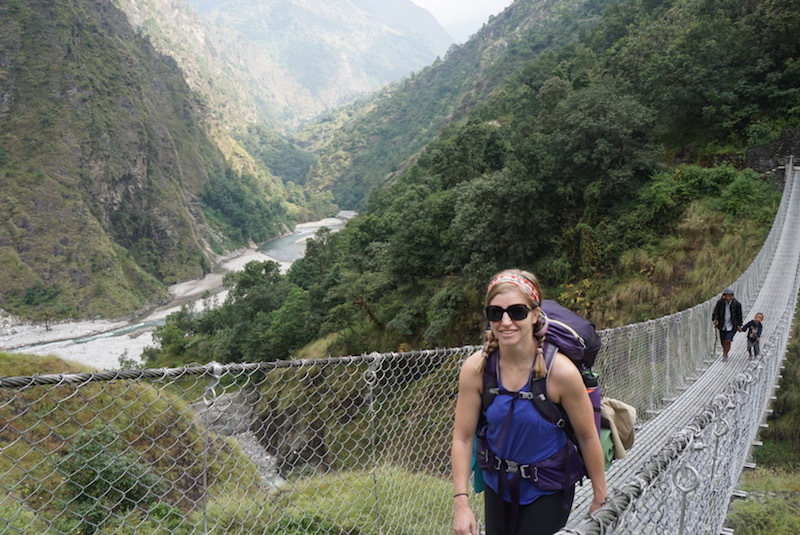 She opted to trek the Ruby Valley Trail and Tamang Heritage Trail in order to get off the beaten path and experience Nepali culture as authentically as possible through local homestays. 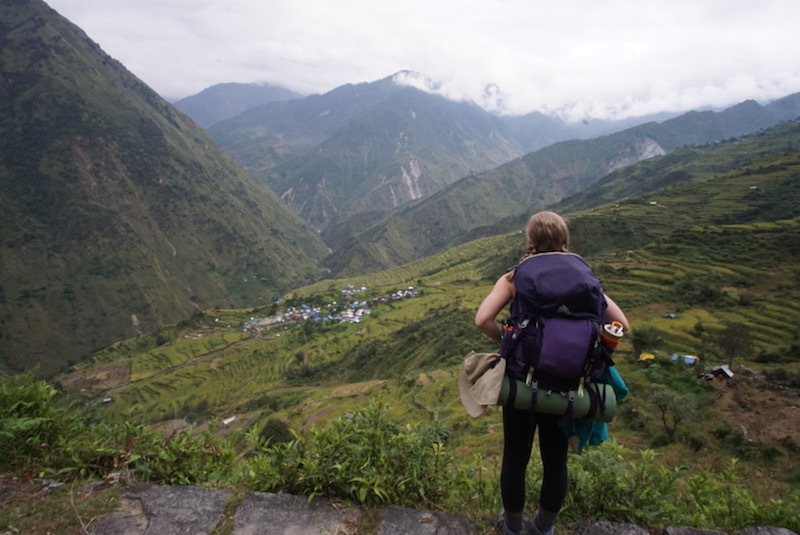 Her time getting to know the wonderful people of Nepal and hiking the stunning mountains is among her fondest travel memories. Interested in doing Ruby Valley Trek? Subscribe and get discount on this trek.